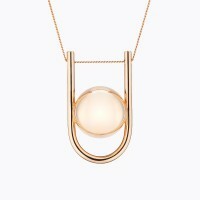 This maternity necklace is a beautiful and calming way to connect with your baby in the womb and enjoy the anticipation of your child coming into the world. Hammered by hand in our Parisian workshop, the perfect sphere of the harmony ball transforms into a full moon, the absolute symbol of fertility and femininity. Worldwide shipping in 7 to 9 business days.